From 1998 – 2001 the University of Oregon Ducks football team reached heights never before thought possible. Unbelievable games, great offenses, bowl victories, high rankings, conference titles, and Heisman contenders. Leading the helm for the potent Oregon offenses during that time, molding players into the best they could be, was offensive coordinator Jeff Tedford. Following Oregon’s triumphant victory over Colorado in the 2002 Fiesta Bowl, it felt like the end of an era…Oregon had reached the crest of the wave, the pinnacle, and the only way now was down. Iconic quarterback Joey Harrington was leaving for the NFL, and Tedford was leaving to take over the head coach job at Cal. He took with him a vast array of Oregon coaches and former players to fill his coaching staff, molding the team in Berkeley from an also-ran into a mirror image of the model Oregon had used to become successful. Tedford had picked from the Oregon ranks, building a staff that included nine former Oregon Ducks, including himself. Tedford’s attempts to Oregon-ize the beleaguered Cal program had an immediate impact. Cal went from the worst program in the conference in 2001 (1-10) to 7-5 the following year, and in 2003 had beaten the seemingly-invincible USC Trojans in triple overtime. It was clear Tedford and his crew of former Oregon Ducks were on their way to changing the perception of Cal Bears football. Oregon meanwhile had appeared to have taken a step backwards since Tedford’s departure. Sure Oregon was still winning games, packing the newly-remodeled Autzen Stadium, and recruiting well…but an embarrassing loss at the end of the 2002 season in the Seattle Bowl to Wake Forest felt like this wasn’t the same Oregon team that had finished #2 in the country at the end of the 2001 season. There were still good players, familiar tenured coaches, and the Autzen atmosphere, but to fans it felt like when Tedford left a piece of Oregon’s success had been taken with him down to Berkeley. 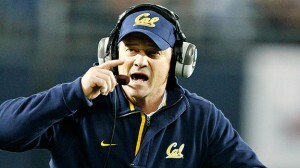 Cal was a team on the rise, Oregon was a team struggling to maintain the success it had felt during the Tedford years. It was easy to understand then why on November 8th, 2003, during the Cal-Oregon game at Autzen Stadium, emotions ran high as Tedford and co. returned to Eugene for the first time since leaving. 2003 had been an up and down season for both teams, Oregon had beaten then-undefeated and #3-ranked Michigan, and Cal had taken down USC in triple OT, but both teams had also suffered some embarrassing losses and were struggling to become bowl eligible. Watching Cal was like a mirror image to what Oregon had been a couple years prior. The same defensive style, the identical playbook used at Oregon, a talented dual-RB tandem in J.J. Arrington and Adimchinobe Echemandu that appeared the second-coming of Maurice Morris and Onterrio Smith at Oregon two years prior, and a talented quarterback destined for success in Aaron Rodgers. Oregon had wanted J.J. Arrington for their own, badly, so much so that Oregon Runningbacks Coach Gary Campbell was sanctioned by the NCAA for forging a signature on Arrington’s Letter of Intent making it appear like he signed with Oregon when at the last minute he had instead chosen Cal. Tedford had become known as a quarterback guru at his various coaching stops, particularly Fresno State and Oregon. Under Tedford’s tutelage Trent Dilfer, David Carr, Akili Smith, and Joey Harrington had all become 1st round NFL draft picks. His next quarterback superstar was now leading Cal, Aaron Rodgers. Rodgers hadn’t been recruited by any division-1 school coming out high school, so he had decided to attend Butte Junior College to continue playing football. One of the first recruits Tedford had pursued since arriving in Berkeley was Butte’s talented tight end Garrett Cross to fill an immediate need in their roster, and Tedford recognized that the quarterback throwing Cross the ball in all the game footage was really good as well. It was Aaron Rodgers, and Tedford wanted him, even though no other school in the country had ever heard of Rodgers. Cal would be the only BCS team in the nation to offer Aaron Rodgers a scholarship, but by the time he was done at Cal two years later he would be a first round draft pick, and today one of the top quarterbacks in the NFL. Watching Rodgers and Cross, Arrington and Echemandu and Tedford coaching on the sidelines was an odd experience for Oregon fans. If an Oregon fan squinted they could swear that it was actually Joey Harrington and Justin Peele, Maurice Morris and Onterrio Smith from two years prior for some reason wearing Cal uniforms…the players looked the same, the playbook was the same, the successful results similar. Cal had become everything that Oregon was. The two teams did not play each other during the 2002 season, making the 2003 game in Eugene the first time Mike Bellotti’s Ducks would face Jeff Tedford’s team of Oregon-esque Cal Bears. Coaches may have preached that it was just another game, but everyone knew it was so much more than that. A national television audience tuned in for the evening’s festivities November 8th, 2003, for the 7pm kickoff of Cal at Oregon. Normally the Ducks would have all the advantages playing at home in front of the raucous Oregon fans, but Cal knew everything about the Ducks. The coaches knew Oregon’s playbook, personnel, tendencies, hand signals, and every nuance of the stadium’s facilities. It would be a battle of the current Oregon team vs. a team built to imitate Oregon of a couple years prior in every way. It clearly meant more to the Cal team as well, evidenced by the words “Beat Oregon” written in big letters and circled in ink on the back of Tedford’s play card that he held up to his mouth while making calls into his headset, visible to everybody. While Cal’s quarterback situation wasn’t in question, Oregon’s leadership was a bit more muddy. The Ducks had a dual-quarterback system using senior QB Jason Fife and freshman Kellen Clemens. Clemens was the better passer, Fife a scrambler who could make big plays with his feet. The tandem at one point in the system their stats combined had the top-QB rating in the country, but in a disastrous loss to Washington State that included seven interceptions the train had derailed and struggled ever since. It is often said that if a team has two quarterbacks, they have no quarterback, as unclear leadership can lead to divisions within the team, inner squabbles over whom should be playing having the potential to tear a team apart. Kellen Clemens would get the start vs. Cal, the 10th of his career, but it was clear from the start that this one would be a defensive struggle. The two teams knew each other too well, they had practiced each other’s schemes, had the same playbooks, the coaches knew each other too well. In a game where two teams are nearly identical in almost every way, it would be a battle of defenses refusing to give up anything. From the start it was clear that Oregon was treating this game differently. Rather than the normal hand signals to call plays, Oregon’s quarterbacks would run to the sideline after every play to be told the play then sprint back to the huddle to deliver the call to avoid the Cal team from being able to read Oregon’s hand signals. On the field the calls being made were recognizable by both teams too. Oregon struggled to find any offensive consistency early, punting after stalling out on the opening drive, but Oregon’s defense also recognized much of their team in Cal’s offense and came ready to play. Thanks to the running tandem of Arrington and Echemandu and Rodgers’ precise passing, Cal had the upper-hand early, stringing together first downs controlling the clock but unable to reach the endzone against Oregon’s stout defense. The game was a grind in the trenches, and while Cal was moving the chains it was a struggle to do so against Oregon’s very talented defensive line, which featured five defensive linemen that would play in the NFL, and would have had six if Haloti Ngata not torn his ACL earlier in the year on a cheapshot in the first game of the season vs. Mississippi State. Oregon meanwhile couldn’t do much of anything right on offense against a Cal defense that knew exactly what was coming before the snap. By the end of the first quarter Clemens was 1/7 passing, and Cal had 13 minutes of time of possession. At the end of the first quarter Cal had put together a scoring drive to take the lead 7-0, but neither defense was caving. However Cal’s ability to methodically move the chains was wearing out Oregon’s defense, fatigue could become a factor later in the game if Oregon’s offense didn’t start making things happen. With Kellen Clemens having difficulty finding any consistency, at the start of the 2nd quarter Jason Fife took over at quarterback. But things remained much the same, while Fife did make some nice plays on scrambles there still wasn’t much offensive consistency, while Cal continued to control the clock inching out small gains against Oregon’s tough defense. On a 3rd & 17 with the ball on their own 20 yard line, Jason Fife uncorked a deep pass connecting with Demetrius Williams for a 32 yard gain. Following the Williams catch, Fife connected with Samie Parker for a first down, suddenly things were clicking and the crowd could sense a new energy in the Oregon team. Riding the wave of momentum, Fife again found Parker, this time for a 13 yard touchdown, tying the game at 7-7. It felt like a new game. Cal had been grinding away at Oregon, but there was a renewed energy in the crowd and with the Duck team…it would not be the only time this would occur. The Duck defense continued its tough play when Cal got the ball back, smothering Cal’s various weapons. But when it looked like Oregon had all the momentum, a lapse in judgment would come back to haunt them. Cal tested Oregon’s secondary on a deep play-action pass, which was broken up by fiery safety Keith Lewis, who then celebrated by doing a throat slash, a celebration that had been outlawed by the NCAA the year prior, an unsportsmanlike flag was thrown. Fans erupted in disappointment, coaches exploded in frustration. With Lewis everyone knew it was a give-and-take. 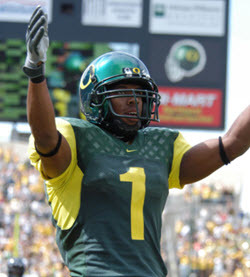 He was one of Oregon’s best playmakers, a ball hawk that always seemed to step up when a play had to be made, but also a player who sometimes lost control of his emotions or let his mouth get the better of him. In the week prior Lewis had talked a lot of trash to the media about Oregon’s matchup vs. Washington, and the Huskies targeted Lewis with multiple cheapshots all game as a result during their 42-10 romp over Oregon. Coach Mike Bellotti berated Lewis on the sidelines for his dumb lapse in judgment. Bellotti was always adamant on playing smart, disciplined football, and it was not the first time that Bellotti and Lewis clashed. But Bellotti also knew he needed Keith Lewis, and made sure to lift him back up after tearing him down for his error. The penalty put Cal deep into Oregon territory with the clock ticking down before halftime, but once again the Oregon defense would step up. With Cal threatening to enter the redzone defensive end Quinn Dorsey, back into the starting lineup after serving his lengthy suspension, showcased his speed off the edge sacking Aaron Rodgers. The sack forced Cal to kick a long field goal, Oregon once again relying on its defense to stay in the game while the offense continued to sputter. At halftime Cal had the lead 10-7, and as rain started to fall there was a sense that Oregon was fortunate to still be in the game with how Cal had controlled the clock while the Ducks seemed inept offensively. The 2nd half continued much of the same way the first half played out. As the rain fell harder adding to the passing woes, Cal moved the ball but were unable to score while Fife and the Duck offense continued to be unable to find any rhythm. The score was still 10-7 in the middle of the 3rd quarter when Jason Fife was able to make a play with his feet, as he had all year long, to create a spark. Building off the momentum of Fife’s 26 yard run Oregon put together a drive into Cal territory, but the Bears defense came up big forcing a Jared Siegel field goal attempt that sailed left, leaving the score still 10-7. As the 4th quarter began, Oregon was pinned back on their own goal line after a great Cal punt was downed at the 6-yard line. On the first play Jason Fife dropped back and threw to fullback Matt Floberg in the flat for a small gain. As Floberg fell out of bounds tripping over some wires suddenly the stadium went dark. The lights had gone out at Autzen Stadium. The crowd roared, while players looked around confused. The night prior at the Rose Garden in Portland the buzzer had been stuck for 11 minutes, and the announcers laughed about all the mechanical issues taking place in the state of Oregon. People stood around, unsure of what to do. The Pac-10 officials discussed what to do if the lights couldn’t get turned back on, and decided that the game would have to be forfeited with Cal, who still led 10-7, declared the winner if the lights were not turned back on soon. Tedford took his Cal Bears team back into the locker room, while Oregon stayed out on the field stretching and running to stay limber. Fans took the occasion to treat it like a party. The Ducks eventually went into the locker room and Coach Bellotti told his team to use the moment. Refocus, make something special happen in the 4th quarter. The adjustments they tried to make in the first halftime hadn’t worked, but being given a second halftime was Oregon’s chance to rebound. Bellotti delivered a speech that got the team pumped. Autzen Stadium had recently been upgraded with an automated computer-controlled lighting system, but somebody had neglected to adjust the lighting settings for the evening kickoff so the lights started shutting down at the normal designated time for a typical afternoon practice or late afternoon kickoff. “We didn’t know what caused it, but when we watched the film we were laughing because we thought Matt Floberg had maybe unplugged the lights because when he fell out of bounds on that play he tripped over some cords,” laughed Tim Day. After an almost 20 minute delay the lights had been manually restarted and gameplay could resume, but it was obvious that something was different. The teams that went into the locker rooms weren’t the same teams that returned to the field. While there was a renewed sense of energy, it didn’t immediately translate into results, as Oregon’s drive continued from where Floberg had gone out of bounds but stalled leading to a punt. When Cal got the ball back, despite the enthusiasm from the crowd and teammates, Cal finally got the big play that everyone had been expecting all night. On a screen pass Cal RB Adimchinobe Echemandu broke a tackle and rumbled for a 35 yard gain down to the goal line. Aaron Rodgers would fumble while trying to punch it in, but he was ruled down. Following a penalty, a pass to WR Geoff McArthur appeared to be complete but the refs ruled it incomplete. The crowd was amped, the defense smelled blood, but Cal would not be denied. The Butte College connection once again hooked up as Aaron Rodgers threw to Garrett Cross for a touchdown to take the lead 17-7. Yet even with the 10-point lead in a tough defensive struggle, the momentum gained from the lights going out still seemed to favor Oregon. The crowd believed that Oregon was going to come back, the team believed they were going to come back, somebody just needed to make a play. The Ducks unfortunately went 3 & out on the next possession, and the ball was back in Cal’s hands with a chance to put it away. The defense held them though, and a nice punt return by Justin Phinisee with 6 minutes left in the game gave Oregon good field position at the 35. It was at this time that Bellotti decided that it was time to give Kellen Clemens another chance. Clemens had not played since the end of the first quarter, throwing a dismal 1-for-7 at the start before being pulled for Fife who had played the entire way since. But Fife had only led one scoring drive, and the team needed a boost. Oregon would need to throw to get back in the game, so it made sense to put in the better passer of the two, even if he had sat on the bench for the past few hours. “Before that drive started Kellen stood right in front of me and asked me ‘are you ready to do this?’ I said, ‘Yeah, let’s do it, we’re about to make this drive happen,'” Day remembers. A pass to Samie Parker followed by an option run picked up a first down. A screen pass to Terrence Whitehead netted an 8-yard gain, getting the Ducks out to midfield. It was then that the magic that everyone had anticipated finally occurred. Kellen Clemens dropped back to throw to the reliable playmaker Demetrius Williams, but the pass went off his hands and almost intercepted by a Cal defender, but somehow freshman wide receiver Kyle Weatherspoon came up with the juggling catch of the year snagging the pass for a big gain after the ball deflected off of two players. The crowd went crazy, the sidelines erupted. Autzen had come alive, the place was electric. Most of all Cal was reeling, and it seemed a foregone conclusion that Oregon was going to score. It would not take long. On the very next play, Oregon would make their presence felt. A short pattern intended to set up a first down had turned into one of the most remarkable individual efforts ever witnessed at Autzen Stadium. Tim Day had taken a 5-yard out and turned it into a 31 yard touchdown, breaking multiple tackles, getting his team back into the game, and making an iconic play that remains to this day his signature moment on a football field. Cal got the ball back, now leading by just 3, and immediately put themselves in a big hole. A holding penalty on the kickoff return backed them up deep, followed by a second flag when there were too many players when Cal huddled by the sideline. Backed up to their own 10-yard line, Cal’s worst field position of the entire game, two runs netted minimal gains. On 3rd down with the stadium going nuts and the offense on the sidelines urging on their teammates, it was Keith Lewis who would make the big play, the man whose dumb penalty in the first half had given Cal their 3-point lead. Stepping into the run lane, Lewis came out of nowhere to stuff the Cal runningback when it appeared there was room to pick up a first down, instead Cal would have to punt. Oregon got the ball back with great field position, and the atmosphere was like something rarely if ever felt at Autzen. Despite being down by 3, everyone at that point could sense the outcome, Oregon was going to take the lead and win this game. “It was one of the loudest times I have ever heard Autzen Stadium, that noise gave us such a boost,” said Tim Day. “Hearing that, it makes a difference. We knew we had to finish, but we felt so cocky like we can’t be stopped. In any game I ever played I never felt that much momentum as a team, like we knew we were unstoppable at that point. The play calling, the offensive line, we found it, we put it together, we were like a train that couldn’t be stopped. We used the momentum from the plays and the crowd to get it down the field on the next drive. I remember seeing the whole defense on the side cheering us on, we didn’t want to let our team down. Kellen Clemens and the offense returned to the field, and immediately connected with a pass to Samie Parker to the 40 yard line. But two incomplete passes set up a 4th down & 3, with 1:34 left on the clock Oregon had to convert the first down or Cal could run out the clock to win 17-14. Needing three yards to extend the comeback drive, Kellen Clemens rolled out and threw to Demetrius Williams near the sidelines, who turned and sprinted down the sidelines for a 25 yard gain. Following Williams’ big gain, a Kellen Clemens keeper went nowhere. The Ducks called a timeout, but coming out of the break Cal miscalculated on the number of defenders and a linemen was late coming off the field, resulting in a penalty when Clemens alertly snapped the ball with 12 defenders on the field, setting up Oregon close to the endzone. A pass intended for tight end Dan Kause fell incomplete, Kause able to get a hand on the pass but unable to come up with the diving grab with a defender on his back. On 3rd and goal, an option run to the left with a pitch to Terrence Whitehead resulted in an easy touchdown run, giving the Ducks their first lead of the day, 21-17. The student section counted off the pushups as the Duck mascot celebrated in his usual fashion, while the Duck football team celebrated on the sidelines. With the extra point the Ducks now led by four, meaning Cal had under a minute to drive the length of the field to score a touchdown, a field goal did them no good. The team implored the crowd to get louder, urging the defense to stop Cal in their last opportunity. Cal struck quickly. With Oregon playing soft prevent defense, on the first play Rodgers found his old junior college teammate Garrett Cross for a deep pass over the middle moving the ball to midfield. The next play Rodgers again found a receiver, hitting Geoff McArthur for a 14 yard gain. With 30 seconds still on the clock, suddenly Cal was in field goal range in just two plays, and the boundless energy suddenly turned to enthused worry. Cal would move to the 33-yard line with 15 seconds left on the clock, enough time to make several attempts at the endzone. When a play was needed, once again Oregon’s playmakers made their presence felt. As Rodgers rolled out to throw deep, Oregon defensive end Devan Long shook free from his blocker and got into Rodgers’ face. In a panic Rodgers threw off his back foot off-balance, floating a pass over the middle of the field short of his receiver. Once again it was Keith Lewis, who had been bitterly chewed out for his error in the first half, who redeemed himself, stepping in front of the receiver and leaping to intercept the pass. Oregon knelt on the ball and the game was over. A game that appeared futile for three quarters had instead turned into one of the most remarkable comebacks in team history, over an opponent that knew every little detail about their team. Somehow Oregon had overcome, defied the odds, thanks in part to a mechanical failure of the lighting system but also through sheer will refusing to lose. In the coming years there would be more tremendous battles between Oregon and Cal. A heartbreaking pass drop in 2004 would give Cal a close 28-27 win at home, followed the next year by a thrilling overtime victory for the Ducks. 2006 Cal would win big, 2007 Cal would win at Autzen by an inch by forcing a fumble at the 1-yard line as time expired. 2008 a monsoon would strike Berkeley resulting in a Cal victory, and leaving everyone in attendance wondering if they would have to swim out of the stadium. Tedford and Bellotti, the two close friends and former coaching staff comrades, had turned both of their programs into contenders and bitter rivals. 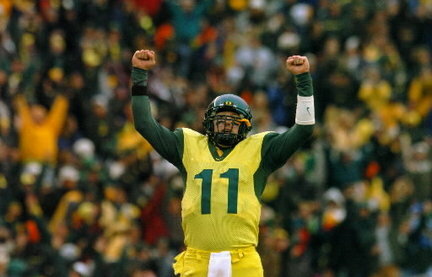 Every time Oregon and Cal clashed, people knew the results would be worth watching, starting with the 2003 game. In the time since Mike Bellotti’s retirement Oregon has had the better of the rivalry, winning the last three games. Tedford continues to coach at Cal, with a coaching staff still largely comprised of individuals with ties to Oregon, still imitating the mold that made the Ducks so successful when he was offensive coordinator there. But for all the great battles between the Bears and the Ducks that have occurred and may be yet to come, none will stand out in people’s memories better than the night the lights went out at Autzen. 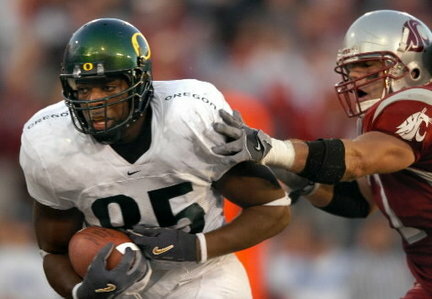 Tim Day was an All-Pac-10 tight end at Oregon who graduated following the 2005 season. Coming from Las Vegas, he had almost chosen to attend Oregon State with his close friend Steven Jackson, but is proud of his decision to instead be a Duck. He played 4 ½ years in the NFL with the Bears, Eagles and Bengals, including time spent at Cincinnati with former Oregon teammate Terrence Whitehead. Multiple injuries requiring surgery led to his decision to retire from football, and Tim now lives in Portland working with Nike. He remains a huge Oregon Duck fan returning to catch games at Autzen Stadium often and is always happy to sign autographs and talk with Duck fans, though he would like to remind people that he did actually make a lot more plays than just the touchdown against Cal in 2003 as that’s what everyone usually wants to discuss, but he appreciates that people remember him for his efforts as a Duck. 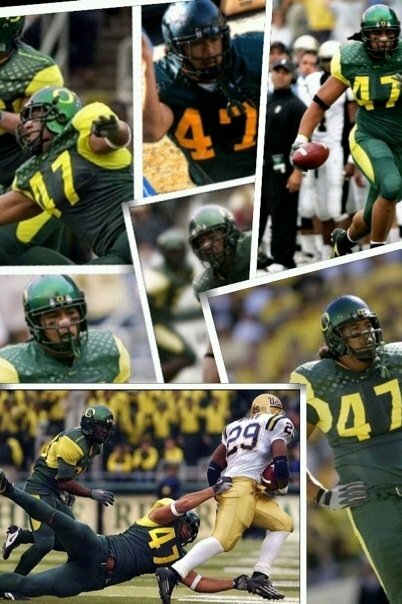 Chris Solomona played for Oregon for three years after coming from El Camino Junior College. In 2004 he joined the Miami Dolphins, but after being among the final cuts decided to return to Oregon to complete his degree. In 2006 he joined the San Jose Sabrecats of the Arena League. He continues to play in the Arena Football League, for the past two seasons a part of the Utah Blaze. Chris lives in Utah with his wife and daughter. He remains a passionate Oregon fan though rarely is able to make it back to Autzen (but is VERY excited about Oregon coming to play the Utes in the future), and always goes out of his way to talk to or honk at anyone he sees in Utah that is representing the O.